GreenRoad’s in-vehicle video system captures footage of events that trigger safety warnings to give you deep visibility into the root cause of risky driving events. Get the context you need to find the root of safety issues, fast. 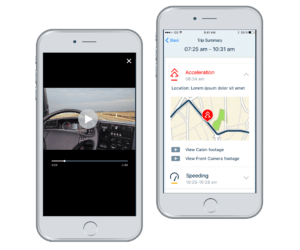 Always-on recording allows organizations to retrieve any portion of a driver’s trip when necessary. Investigate events in a timely manner, reduce collision costs, and decrease fleet insurance premiums. GreenRoad stores critical events caused by unsafe driving behavior, so you don’t have to waste time sifting through irrelevant video footage. It’s 24 hours, distilled to the critical moments that really need your attention. Alleviate driver concerns of constant surveillance while getting the data you need to protect your fleet drivers and fleet vehicles and grow your business.